Package Includes Sensitizer. Blue Color - Proclaim is a diazo-photopolymer (dual-cure) emulsion formulated to provide unequalled exposure latitude and ease of decoating, even if underexposed and used with aggressive inks and solvents. Proclaim is fast-exposing, and provides good acutance. Its high solids content (37%) provides good stencil build per coat, excellent mesh bridging, and fast-drying capabilities. Proclaim has superb coating properties and durability, and is resistant to all solvent-based inks as well as water-based UV-cured inks. 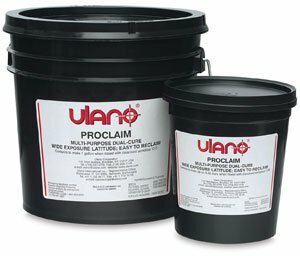 Proclaim is ideal for general graphics, textile, and industrial applications. Light blue in color, Proclaim turns light green when sensitized. Properly exposed non-image areas revert back to the original blue color, providing a built-in indicator of adequate exposure.